Munich's capital city Bavaria is an attractive destination for exploring. The city boasts nice-looking landmarks, vast oases of greenery, delicious food and a lot of sunlight. The Olympic Park, English Garden, Nymphenburg Palace, Old Town, and Marienplatz are only some of its many points of interest you will fall in love with. In addition, beautiful destinations you ought to discover are many while available time might be limited. Therefore, you should book a sightseeing bus tour to make the most of your time in Munich. To help you choose the one that suits your needs best, we have collected all necessary information regarding both providers. Available live and pre-recorded commentaries on board provide insightful data about the city and its attractions. 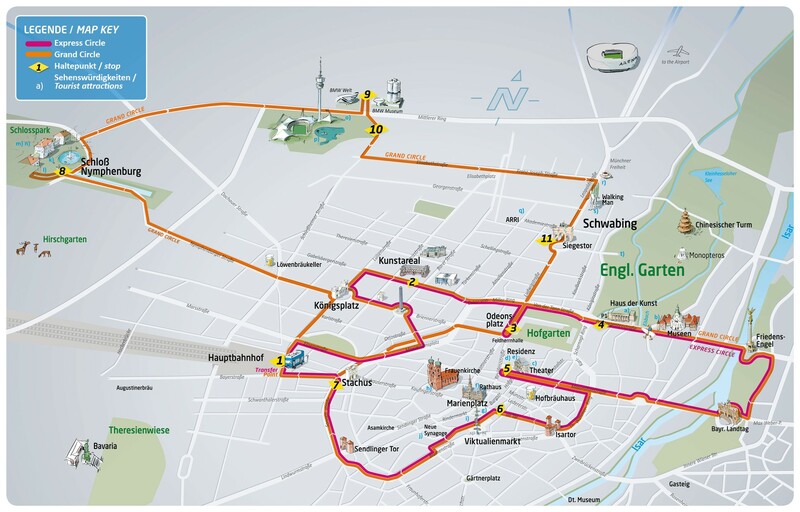 With the Munich City Tour Card, you are eligible for a certain discount on the Hop-on Hop-off Bus Tour ticket. Every bus has audio commentary available for introducing the city and its attractions. Buses don t have ramps for wheelchairs. Audio commentary is available in French, Italian, Spanish, Portuguese, Russian, Japanese and Chinese. All 3 lines have 15 stops throughout the city in total. Other amenities Free Wi-Fi on board every bus. You are allowed to board your dogs with you. You receive no refund if you cancel 2 days in advance or less. How to use Both printed and electronic vouchers are valid. Present your printed or mobile voucher to board the bus. Where to Buy Munich Hop-on Hop-off Bus Tour? We are comparing the Best Hop On Hop Off Munich City Sightseeing tour Prices from leading online Tours and Ticket suppliers, try to find you cheap tickets prices on the market. Where to Buy Munich Sightseeing Bus Tour? Explore Munich's top famous attractions, beer halls, monuments and parks on a comfortable city sightseeing hop-on-hop-off bus tour. Enjoy a combination of leisure and flexibility as you explore at your own pace. With a 24 hour or 48-hour ticket, you get to pass through a 1-hour route that has some of the most popular sights and attractions such as the Odeonsplatz, Olympic Park, and Nymphenburg Palace. Listen to the onboard audio commentary while you marvel at the monuments or hop-off at any of the stops to explore and take strolls around the English Garden, Marienplatz or relax with a beer (on your terms) at one of the legendary beer halls 'Hofbräuhaus”. Hop-on and off the city sightseeing bus at an interesting point and walk around on your own. Cool off with a bottle of beer at Hofbräuhaus beer hall one of the most famous in Munich. With the ticket, you get discounts at attractions and other places in Munich. How much is a 1/2/3 day Munich City Sightseeing Bus Tours? All children under 4 years ride the City Sightseeing Bus for free. We are comparing the Best Munich Sightseeing Bus Tour Prices from leading online Tours and Ticket suppliers, try to find you cheap tickets prices on the market. Bus stops: There are 3 tours to choose from which are; the City Tour, the Nymphenburg Olympic Park Tour, and the Schwabing Tour, and each route takes an hour. The three routes comprise of 13 stops throughout Munich. NOTE: Tours end at 2 pm on 24 December and starts at 12 pm, 01 January annually. The City sightseeing Bus Tour takes you to places you most likely wouldn't see on your own. With this ticket, you get to see lots of attractions such as Nymphenburg Palace, Olympic Park, Marienplatz, and Odeonsplatz. Aboard the bus, you get to get enlightened while listening to the audio commentary in 9 different languages. You can hop-on and off as many times as you want to and also take a stroll to explore more of Munich on foot by visiting places like the English Gardens and relaxing with a beer at the Hofbräuhaus beer hall (at your expense) before boarding the bus at the next stop. It is fun-filled and flexible such that you get to plan yourself and explore at your own leisure. While back on the city sightseeing bus you get to admire the picturesque of Munich with panoramic views. It is indeed an exciting way to enjoy value for your time and money. Is the Munich City Sightseeing Bus Right for Me? This City Sightseeing Bus Tours is pretty much the best for first-time visitors to Munich and previous visitors as well. It exposes tourists to some of the most famous and popular attractions and places in Munich such as parks, beer halls, gardens, museums and many more. While on the city sightseeing bus, you get to enjoy the onboard audio commentary which is delivered in 9 different languages and panoramic view of the city's best places to be. With a 24 or 48 hour ticket, you get to explore, popular places such as the Nymphenburg Palace, Olympic Park, the English Garden, the historic Old Town, Odeonsplatz, and Marienplatz just to name a few. Hop-off at any stop of your interest to further embark on a walking tour at your own pace and board the bus at the next stop. You can as well cool off with a beer at the Hofbräuhaus beer hall (at your expense) one of the legendary beer halls in the city. This is truly a way to soak yourself in the Bavarian capital. Explore Munich in the easiest way ever possible on a fun-filled and flexible Grand Hop-on Hop-off Double-Decker Gray Line City Bus Tour. With just a 24-hour ticket, you get an express and exclusive tour to Munich's most amazing highlights and attractions. If you intend to take the excitement higher than ever, you can go for the 24 or 48 hour Grand Tour tickets which gives you a wider range of sights to see. You get to settle onboard a comfortable open-top double-decker Gray line bus an listen to an enlightening onboard audio commentary with a panoramic view of top attractions like the Hofbrauhaus, Marienplatz, and Viktualienmarkt just to name a few. Hop-on and off at any of the stops of your choice and go further on foot to see and admire attractions closer, you can board the bus at any of the stops you wish. Choose between the 24-hour Express, 24-hour or 48-hour Grand Tour tickets to explore a wider range of sights to see in Munich. Upgrade to the 24 or 48-hour Grand tour ticket to see more sights in the city. Hop-on and hop-off at any time and stop for a personal walking tour at your leisure. With the ticket, you get discounts at shops, restaurants, and attractions in Munich. How much is a 1/2/3 day Munich Hop-on hop-off Bus Tour? All children under 3 years ride the Munich double-decker open bus for free. Bus stops: Munich Central Station (Hauptbahnhof), Pinakotheken, Odeonsplatz, Icewave, Max-Joseph-Platz, Marienplatz, Karlsplatz, Nymphenburg Palace, Olympia Park, and Schwabing/Siegestor. TripAdvisor Reviews: with a very impressive rate of 5 by its former users, the Munich Grand Hop-on Hop-off Double-Decker Bus (Gray Line) sightseeing service ranks very well. The number of dissatisfied travelers is far below those that are very satisfied. The overall number of reviews is 858 and 370 of participating tourists rated the bus tour as excellent. About 212 previous users gave it a very good rate. Viator Reviews: Tourists who have left reviews on Viator based on past experiences gave the Munich Grand Hop-On Hop-Off Double-Decker Bus Tour (Gray Line) a 4 rate with an overall number of 968 past users. Get Your Guide Reviews: Some people who got their tickets for the Munich Grand Hop-On Hop-Off Double-Decker Bus Tour (Gray Line) through Get Your Guide website rated it a 4.3 (81 reviewers) rate. The Munich Grand Hop-on Hop-off Double-Decker Bus Tour services offered by Gray Line is an awesome way of getting acquainted with the German city of Munich. This tours gives you the freedom to hop on and off the Gray Line double-decker open-top bus to see this ancient Bavarian capital city and its numerous museums. The Munich Grand Hop-On Hop-Off Double-Decker Bus Tour (Gray Line) has an onboard audio commentary which is exciting and educating at the same time in 8 languages. With an option to upgrade to the 24 or 48-hour Grand ticket to see beyond your sightseeing pleasure. You can explore on foot and hop-on back after seeing the fantastic castles and gardens in Munich. These are the wonders you get to enjoy with the Munich Grand Hop-on Hop-off Double-decker Bus Tour Tickets. Is the Munich Hop-on hop-off Right for Me? The Munich Grand Hop-On Hop-Off Double-Decker Bus Tour (Gray Line) is just an excellent way to see beautiful attractions in the city of Munich. Aboard the open-top double-decker bus, you get a panoramic view of the top attractions in the city with an audio guide in 8 different languages. You can hop-on and off at any stop that interests you to explore on foot at your own leisure and board the bus at the next stop of your choice. With an upgraded ticket (24 or 48 hour Grand Tour Tickets), you get to see more amazing places such as the many castles and their gardens, visit and shop at the Viktualienmarkt, Marienplatz, the Pinatheken, and Karlsplatz. You get to learn about the history of this great German city from it numerous museums and ancient buildings. It is definitely right for you to spend an exciting vacation in Munich. Where to Buy Munich Grand Hop-On Hop-Off Double-Decker Bus Tour (Gray Line) Tickets?